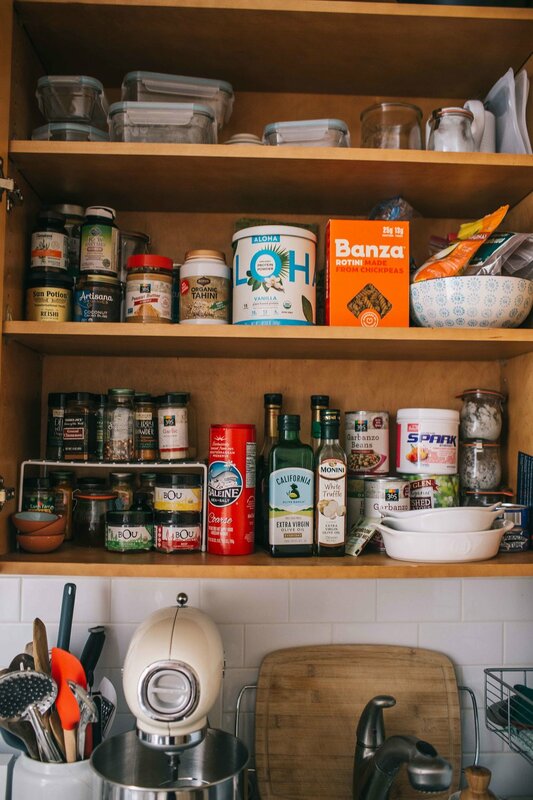 a peek inside my tiny NYC cooking space and what products I think are worth using! Hi friends! Since we moved to New York City, Frank and I have been getting used to living in smaller quarters than we did to growing up and in college. Our kitchen especially is our favorite space - and also our smallest. We've had to get really creative with what products are our absolute favorites, and not everything made the cut. We are more focused on having a few high quality items that can be used in many different ways rather than just having a ton of gadgets that we never use. We have had to get really creative with how we use our kitchen (well, Frank mostly with his use clever innovation). So, in an effort to increase counter space, we have a cutting board that fits over the sink (that is stored behind the faucet) and a little rolling pantry cart with a cutting board surface that I use for chopping and extra space when cooking multiple meals. Below, you can see a little more of what I store in the cart. On top of the cart, I use for the toaster so that when needed and I can use the rest of the space for chopping and food preparation. We hang our pot holders, pans + measuring cups on the little hooks. Not the most organized, but we have one main cabinet, plus one above the microwave and one above the fridge, that we use for food storage. In addition to our little cart that holds our grains, dry goods, potatoes, onions, our mixing bowls and casserole dish, we use the cabinet for spices, oils, glass containers, etc. Below you can catch a glimpse of the cart and utensils we use: like the hanging pans + pot holders, our wooden spoons, etc. I've listed them more in detail later. We use bathroom hooks to hang up our ladle and wooden spatula and we use a bathroom caddy to hang our sponges and dish washing things on the side of the fridge. On top of the fridge, we have a drying mat to make doing dishes easier since we don't have a dishwasher! (*gasp*!) To help store bowls, jars, and mugs, we installed a little shelf above the seating area in the kitchen as well. We have 4 main pieces of equipment we keep on the counters that we use daily (with the exception of the mixer than I use at least 3x a week - stand mixer, food processor, blender, and toaster. We have only one drawer + one utensil holder so we have to be very picky about what utensils mean the most to us and serve multiple purposes. I've included a list of my favorite kitchen products and items I use that I get asked about often! Because I just moved to the city and graduated college, many of these items were gifts from my mom who has a cooking supply store (shocker!). By no means do I want to infer that these are the only options for equipment or cooking, but I have grown to love them! Love-quote measuring spoons (From The Culinary Stone) - they are the best. They say things like '1 tsp of love', etc. As my kitchen grows with my love for cooking, I hope to continue to add to this list and encourage people with even the smallest of kitchens that good food doesn't need a ton of space.